The tests, now in their second year, take advantage of the ability of Sandia's National Solar Thermal Test Facility to simulate a very rapid increase in temperature followed by an equally rapid decrease. The testing is for the Air Force and will continue for at least another year. Specialty ovens can reach the temperatures needed, but ovens can't heat up or cool down rapidly. "And it's hard to just stick a coupon in real fast and then take it out," test engineer Josh Christian said. "Our facility is really good at providing a fast ramp rate for these heating curves, and we also can produce a trailing curve by moving our mirrors in such a way to remove the heat from the sample." "The heat goes in, we close, that's the end of the test," Christian said. "We do this repeatedly, 10 to 30 times a day." Before and after a test, another Sandia team checks the sample with a 3-D scanner, which determines whether the heat produced bubbles or texture changes in the material, Christian said. Still another group of Sandia researchers takes reflectivity measurements—how much light is reflected from the surface. For example, if a sample absorbs 90 percent of the light and reflects 10 percent, then 10 percent of the light did not heat it. Josh said that's important because in real life, materials with a high reflective value heat up slower. "For our facility, this is a major test that has started to become routine as we have tested hundreds of samples," said Christian, who has worked at the tower for eight years. 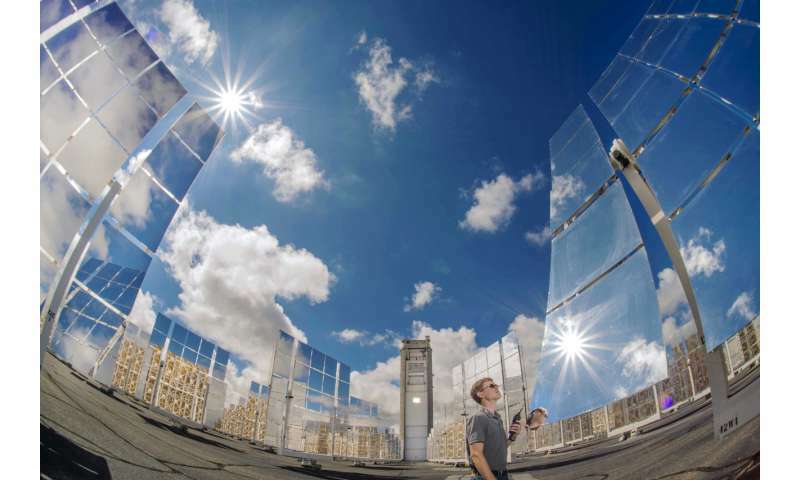 The mirrors move with the sun to keep a reflected spot on the solar tower, "but we were finding that at certain times of the year and times of the day, the spot wouldn't be where we predicted it to be because of imperfections in how the mirrors were installed," Christian said. So, he said, researchers developed algorithms to improve the tracking, which not only helps the Air Force project but also Sandia's tower overall and potentially other facilities that use heliostats, such as sites that generate power. The tower has done tests for other agencies, including NASA, and other projects for the Air Force. Sandia started tests for this project last year. "Now it's become a success on our side as well as their side," Christian said.